Employment rose by 54,000 in July, driven by gains in part-time work. The unemployment rate declined by 0.2 percentage points to 5.8%. In the 12 months to July, employment grew by 246,000 (+1.3%). These gains were largely the result of growth in full-time work (+211,000 or +1.4%). Over this period, the total number of hours worked rose by 1.3%. Ontario, British Columbia and Newfoundland and Labrador recorded employment increases in July. At the same time, the number of workers declined in Saskatchewan and Manitoba, while it was little changed in the other provinces. Employment rose in a number of services-producing industries: educational services; health care and social assistance; information, culture and recreation; and the "other services" industry. In contrast, employment fell in most goods-producing industries, specifically manufacturing, construction and natural resources. The employment increase was driven by public sector employees, while there was little change in the number of private sector employees and the self-employed. In July, employment rose for core-aged women (25 to 54) and edged up for women aged 55 and older. At the same time, employment was little changed for the other demographic groups. Employment rose by 61,000 in Ontario, with all the increase in part-time work. The unemployment rate fell 0.5 percentage points to 5.4%, matching the most recent low recorded in July 2000. Compared with July 2017, employment grew by 183,000 (+2.6%). In British Columbia, the number of people working increased by 11,000 and the unemployment rate was 5.0%. Despite this increase, employment in the province was little changed on a year-over-year basis. 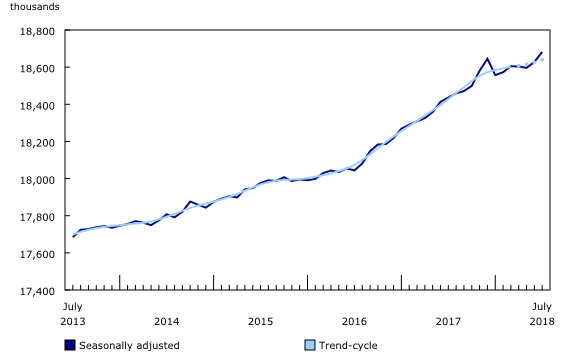 Employment in Newfoundland and Labrador was up 2,400, the first notable increase since October 2017. As more people participated in the labour market, the unemployment rate was virtually unchanged at 15.4%. On a year-over-year basis, employment in the province grew by 5,300 (+2.4%). In Saskatchewan, employment fell by 4,200, bringing the unemployment rate up 0.3 percentage points to 6.6%. Compared with 12 months earlier, employment was little changed in the province. Employment in Manitoba declined by 3,600, mostly offsetting the increase recorded the previous month. The unemployment rate was virtually unchanged at 6.0%, as fewer people participated in the labour market. Employment in the province was little changed compared with July 2017. 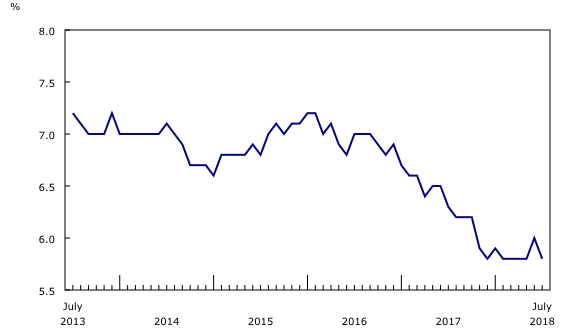 In Quebec, employment was essentially unchanged on a month-over-month and year-over-year basis, and the unemployment rate was 5.6% in July. In Alberta, employment held steady as a decrease in full-time work was largely offset by an increase in the number of people working part time. The unemployment rate was little changed at 6.7%. On a year-over-year basis, employment in the province rose 40,000 (+1.7%), all in full-time work. In July, employment increased by 37,000 in educational services, mainly in Ontario and Quebec. At the national level, the gain was mainly in employment in post secondary institutions, particularly universities, and was largely in part-time work. Compared with 12 months earlier, employment in educational services increased by 80,000 (+6.3%). The number of people working in health care and social assistance rose by 31,000, largely in Ontario. Despite this increase, employment in the industry was virtually unchanged on a year-over-year basis. Employment grew by 12,000 in information, culture and recreation, driven by gains in British Columbia. In the 12 months to July, employment in this industry was little changed. In "other services," employment was up 11,000, bringing year-over-year gains to 28,000 (+3.7%). "Other services" includes services related to private households, and repair and maintenance. In contrast, the number of workers declined by 18,000 in manufacturing, more than offsetting the increase in June. In the 12 months to July, employment was little changed in the industry. Employment in construction decreased by 12,000 in July. On a year-over-year basis, employment in this industry was up 35,000 (+2.5%). In natural resources, the number of workers was down 5,300 in July and was little changed on a year-over-year basis. In July, employment for public-sector employees increased 50,000, while the number of employees in the private sector was virtually unchanged. On a year-over-year basis, public-sector employment rose 132,000 (+3.6%) and the number of private-sector employees was up 69,000 (+0.6%). The number of self-employed workers was little changed both on a month-over-month and on a year-over-year basis. For the core-aged (25 to 54) population, employment increased by 35,000, boosted by gains among women (+30,000). The unemployment rate for women in this age group was down 0.3 percentage points to 4.9%, while it was unchanged for men at 5.0%. In the 12 months to July, employment grew for both women (+72,000 or +1.2%) and men (+41,000 or +0.6%) in the core-aged group. In July, employment for women aged 55 and older edged up 12,000 and their unemployment rate declined 0.3 percentage points to 4.2%, matching a low recorded in April 2008. For men in this age group, employment was essentially unchanged and their unemployment rate was 5.8%. On a year-over-year basis, employment for men and women in this age group grew by 148,000 (+3.8%). Employment for all youth aged 15 to 24 was little changed in July. As fewer of them searched for work, the unemployment rate fell 0.6 percentage points to 11.1%. Compared with 12 months earlier, employment for this group was virtually unchanged. From May to August, the Labour Force Survey collects labour market data on youth aged 15 to 24 who were attending school full time in March and who intend to return to school full time in the fall. Published data are not seasonally adjusted; therefore, comparisons can only be made on a year-over-year basis. In July, employment among students aged 15 to 24 declined by 67,000 (-5.0%) compared with a recent high in July 2017. Over the same period, their unemployment rate fell 1.1 percentage points to 12.8% as fewer students in this age group participated in the labour market. Employment among students aged 20 to 24 was essentially unchanged compared with July 2017, and their unemployment rate was 6.6%. For students aged 17 to 19, employment fell 76,000 compared with 12 months earlier. At the same time, their unemployment rate was little changed at 12.9% as fewer students in this age group participated in the labour market. For 15- and 16-year-olds, employment increased by 22,000 in the 12 months to July. Over the same period, their unemployment rate declined 3.9 percentage points to 24.0%. Adjusted to the concepts used in the United States, the unemployment rate in Canada was 4.8% in July, compared with 3.9% in the United States. In the 12 months to July 2018, the unemployment rate declined by 0.5 percentage points in Canada and by 0.4 percentage points in the United States. The labour force participation rate in Canada (adjusted to US concepts) was 65.3% in July compared with 62.9% in the United States. On a year-over-year basis, the participation rate decreased by 0.3 percentage points in Canada, while it was unchanged in the United States. In July, the US-adjusted employment rate in Canada was 62.2%, compared with 60.5% in the United States. On a year-over-year basis, the employment rate was unchanged in Canada, while it increased by 0.3 percentage points in the United States. For more information on Canada–US comparisons, see "Measuring Employment and Unemployment in Canada and the United States – A comparison." The Labour Force Survey (LFS) estimates for July are for the week of July 15 to 21. The LFS seasonal adjustment process removes typical seasonal patterns in the monthly data, according to trends established in previous years. Changes in employment in educational services during the summer months could reflect a number of atypical factors such as contract adjustments, the extension of spring semester, and increased enrollment in summer courses. The next release of the LFS will be on September 7. Labour Force Information (Catalogue number71-001-X) is now available for the week ending July 21. The product Labour Market Indicators, by census metropolitan area, seasonally adjusted (Catalogue number71-607-X2017001) is available. This interactive dashboard provides easy, customizable access to key labour market indicators. Users can now configure an interactive map and chart showing labour force characteristics at the national, provincial or census metropolitan area level. For more information on the economy and Labour Force Survey, watch the most recent video from the new series Review of Economic Statistics (Catalogue number36260001). To enquire about the concepts, methods or data quality of this release, contact, Vincent Ferrao (613-951-4750; vincent.ferrao@canada.ca), Emmanuelle Bourbeau (613-951-3007; emmanuelle.bourbeau@canada.ca), or Client Services (toll-free: 1-866-873-8788; statcan.labour-travail.statcan@canada.ca), Labour Statistics Division.